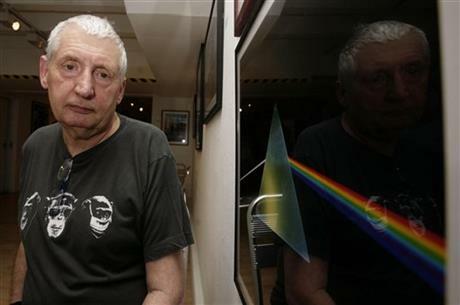 Storm Thorgerson, who designed Pink Floyd’s The Dark Side of the Moon album cover, has died aged 69, the band’s management has confirmed. A childhood friend of Pink Floyd’s founding members of the band, Storm Thorgerson became their designer-in-chief, fashioning a string of eye-catching creations. Storm Thorgerson designed the cover showing a prism spreading a spectrum of color for The Dark Side Of The Moon. Storm Thorgerson’s family released a statement saying he died peacefully on Thursday surrounded by family and friends. “He had been ill for some time with cancer though he had made a remarkable recovery from his stroke in 2003,” the statement said. Pink Floyd guitarist and vocalist Dave Gilmour released a statement in which he said the artworks Storm Thorgerson created for the band had been “an inseparable part of our work”. Dave Gilmour said: “We first met in our early teens. We would gather at Sheep’s Green, a spot by the river in Cambridge and Storm would always be there holding forth, making the most noise, bursting with ideas and enthusiasm. Nothing has ever really changed. A statement on the Pink Floyd.com official site said: “We are saddened by the news that long-time Pink Floyd graphic genius, friend and collaborator, Storm Thorgerson, has died. Storm Thorgerson began his career with UK design group Hipgnosis, founded in the late 1960s and his distinctive style made him one of the industry’s most recognizable artists. There was the mournful-looking cow on the front of Atom Heart Mother, the burning businessman on the sleeve of Wish You Were Here, the giant pig flying over Battersea Power Station and the prism spreading a spectrum of color across The Dark Side Of The Moon.